Badgro started his NFL career with the New York Yankees in 1927 and stayed for two seasons in which he scored one touchdown. He switched over to baseball, playing as an outfielder for the St. Louis Browns and batting .257 in 143 games before returning to football, now with the Giants, in 1930. Outstanding as a blocker and on defense, he was also noteworthy as a pass receiver although the team rarely went to the air. 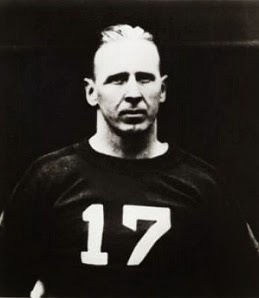 He scored three touchdowns in ’30 and was a second-team All-NFL selection of the Green Bay Press-Gazette, and in 1931 gained first-team recognition from the NFL. Pass receiving statistics were first compiled in ’32 and Badgro had six catches for 106 yards that year and 9 receptions for 176 yards and two TDs in 1933, when he received first-team All-NFL honors from the league and the Press-Gazette and scored the first touchdown in the NFL Championship game loss to the Bears. Giants went 8-5 to finish first in the NFL Eastern Division. Won NFL Championship over Chicago Bears (30-13). Badgro played one more season with the Giants in 1935, but was limited to five games and one catch. Hired as a player/coach for the Syracuse Braves of the AFL for 1936, the team failed to last the season and Badgro finished up back in the NFL as a player with the Brooklyn Dodgers in his final year. Officially, he caught 35 passes for 560 yards (16.0 avg.) and seven touchdowns. Badgro received first-team All-NFL recognition after three seasons and, 45 years after he last played, he was inducted into the Pro Football Hall of Fame, Class of 1981.